Last week our family had a lovely holiday in Playa del Carmen, Mexico. We stayed at an all-inclusive Spa and Resort. "All inclusive" you say?... err... not exactly a foodies type of holiday, but, we were happily surprised. Often, we ate lunch by the pool (my daughter Aria's favorite spot). Manuel, our pool attendant brought us delicious bites like freshly made guacamole and homemade tortilla chips and my favorite, whole wheat baguette's with grilled veggies and goat cheese (the goat cheese wasn't on the menu but I requested it and they had it!) They also served french fries which the kids indulged in daily:-) Being an all-inclusive resort, I didn't expect the freshness and the overall, decent quality of food. The dinners were pretty exceptional. With my brother and his family there, David and I were able to enjoy our first date night since Aria was born (two years ago). It was a big success and we actually went out two nights, alone, to the same restaurant (thank you guys!). We reserved at a french restaurant in the resort called Piaf, named after the fabulous french vocalist Edith Piaf. The decor of the restaurant was stunning, the service was intimate and perfect and the food was mmmmmmmmmmm...... Every bite was exquisite. Oh, the name of the resort was Grand Velas Resort and Spa - Riviera Maya. If you're ever heading that way, please take me with you!!! Squeeze the juice from 2 oranges and 1 lime (makes approximately 1 cup of juice total). Set juice aside and spoon the finer bits of orange and lime pulp onto a plate. Mix 1 tbsp of sugar with the pulp. Dip the rim of your clean drinking glasses into the sugar/pulp mixture to coat and create an attractive Margarita glass. 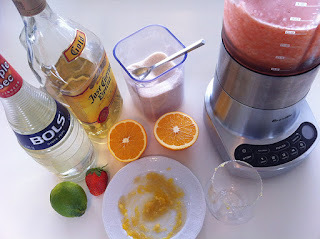 In a blender add 2 cups of ice, squeezed juice from oranges and lime, strawberries, tequila and triple sec. 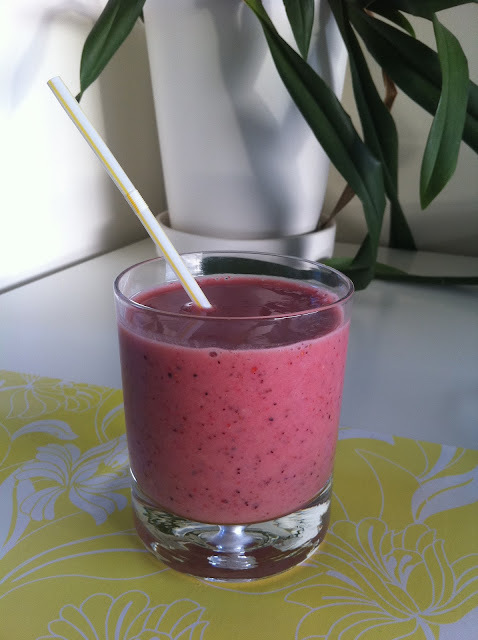 Set blender to Ice Crush mode (if available) and blend until ice is crushed. 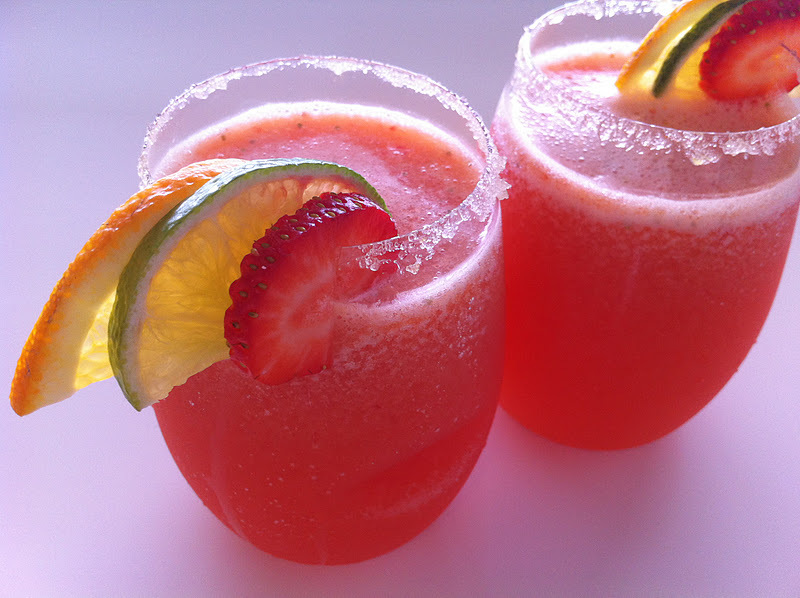 Serve in the sugar/pulp rimmed glasses and garnish with a strawberry, slice of orange, lime or all three. Sapore! Directions: Heat 4 cups of Milk and in a saucepan and add 1 Tsp of Salt. Watch the Milk carefully and just before it begins to boil turn the heat off. Stir in Juice from one Lemon. Let the mixture stand for 5 minutes. 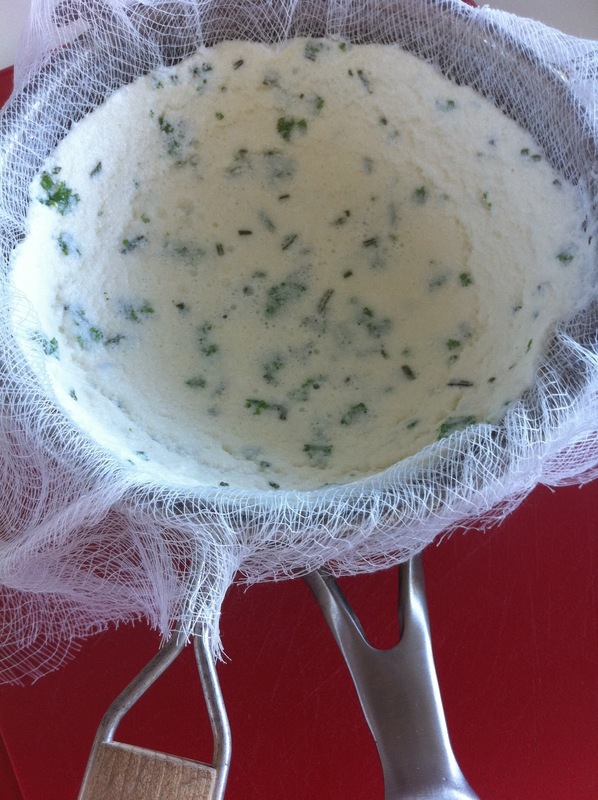 Add any Fresh Herbs or Roasted Garlic (1 to 2 tbsp in total) and stir. Place a mesh strainer over a large bowl and drape a square of cheese cloth over the strainer. Pour the Milk mixture through the cheese cloth. Gather the 4 corners of the cloth and cinch them together to form the Cheese into a ball then secure with some twine (pictures below). 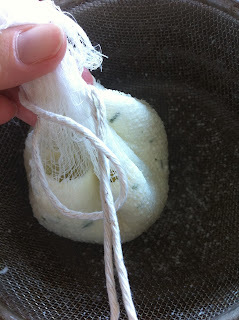 Hang the bound Cheese over a bowl or sink (I tie mine to the faucet in my kitchen sink). Let the Cheese drip for about an hour. 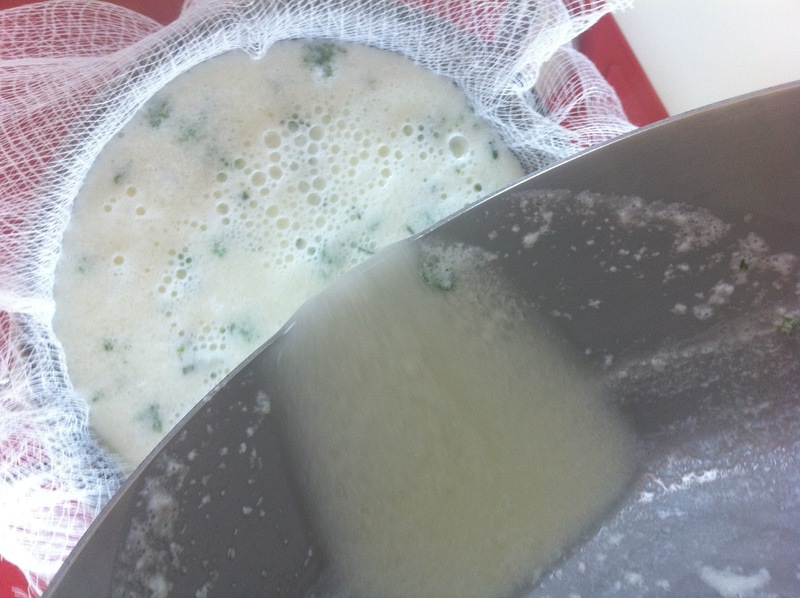 Give the Cheese a few squeezes to remove any extra liquid. Untie the twine and place Cheese in a bowl. Add a small pinch of Salt and mix with a fork. 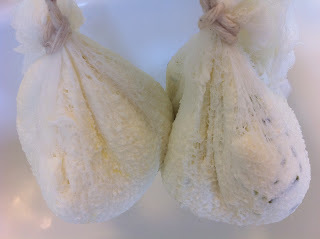 Gather up Cheese with clean hands and roll into a ball or log. Serve with crackers, bread or on top of salad. Sapore! 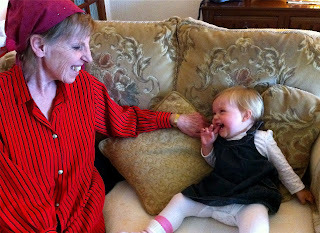 After a year of illness my mother sadly passed away on October 12 2011. Just two months before, my mother-in-law had passed away. 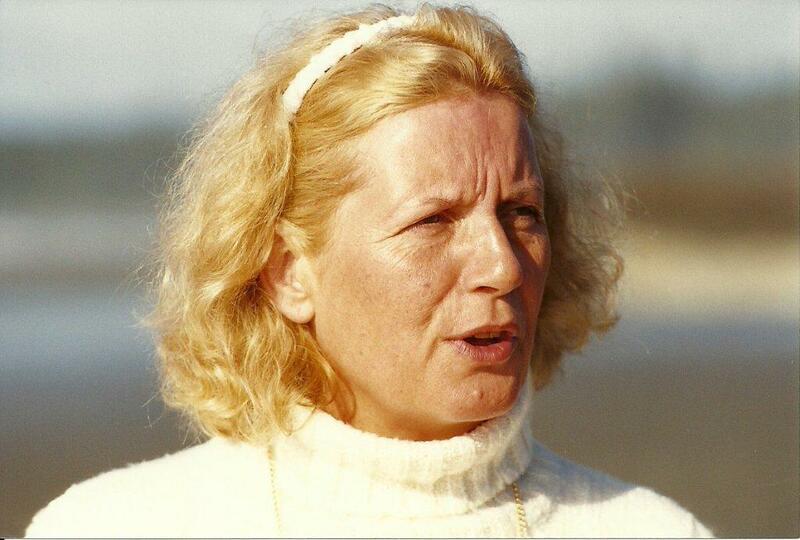 In the spring my dear aunt and close friend lost her fight to cancer. 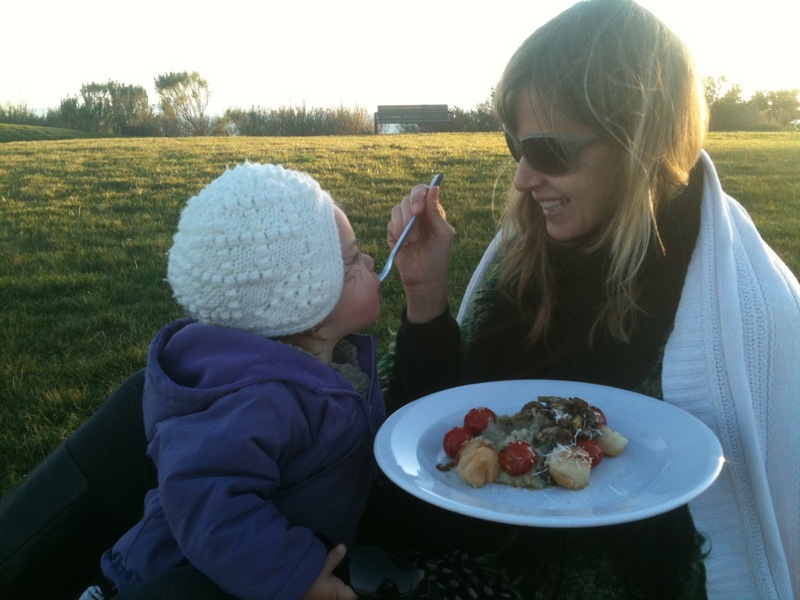 Entwined with all the sadness, the year for my daughter and I consisted of countless airplane rides from Los Angeles to England and Canada, on the go cooking and unpleasant hospital food. We spent a tremendous amount of time separated from my husband, my daughter's daddy. All our familiarity was segmented into short visits. 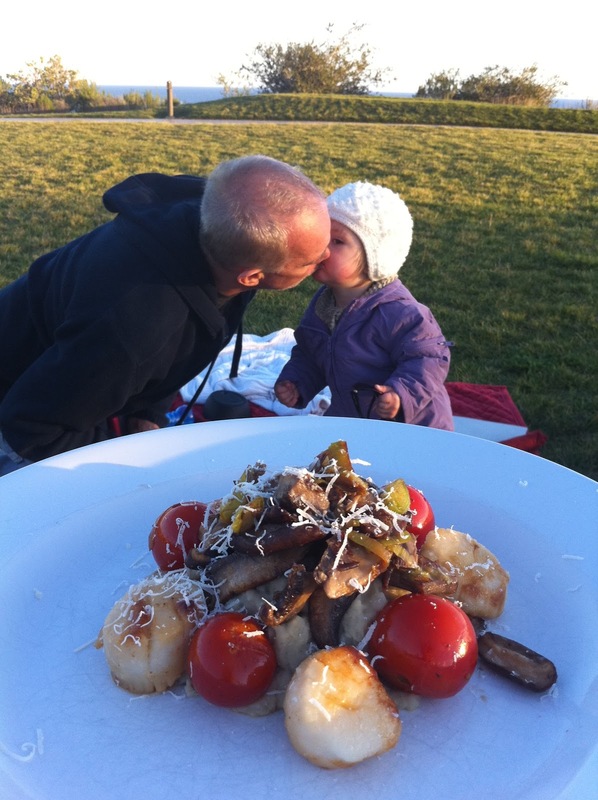 Even before David (my husband) and I had a child we had a substantial commitment to eat our meals together. For twelve years we've kept alive a sacred routine of kissing before every meal. Most days we eat breakfast and dinner together. Now having a two year old, I value this foundation that my husband and I have established for appreciating our food and each other's company. I love that food joins us regardless of our busy schedules. 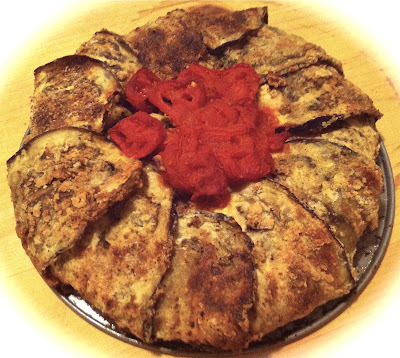 Now that we're home and our routines are being reestablished I want to launch back into sharing my recipes. Although I spent much of this year away from the kitchen, the ideas and concepts kept flowing. 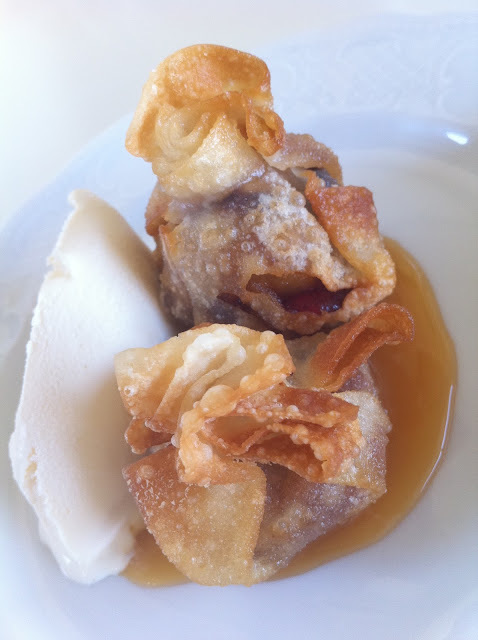 I hope you enjoy the upcoming recipes and please feel free to leave a comment or follow SAsapore to stay connected. Thanks for all your support. Here's to a new beginning! 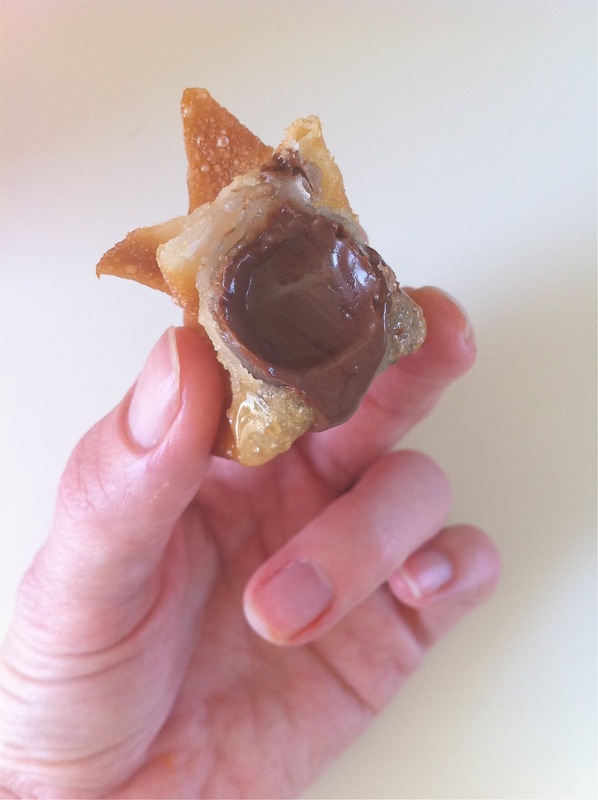 I used a deep fryer for this but if you don't own a deep fryer an old pot will do ~ Heat Canola Oil to 375° ~ While the Oil is heating, place Wonton Wrapper flat on a board ~ Take a piece of Chocolate, roll and fold it into the Wonton Wrapper (doesn't have to be perfect, just fold the Chocolate in so that the Wrapper completely covers the Chocolate) ~ Make as many Chocolate 'Packages' as you desire ~ Once Oil reaches 375°, gently submerge the Wonton 'Packages' in the Oil ~ Avoid crowding and depending on the size of your deep fryer or pot you may want to do more than one batch (note: your Oil will loose heat after cooking a batch. 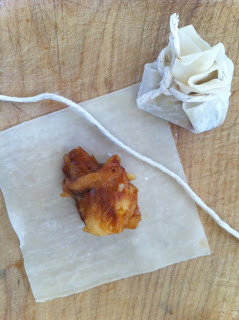 If you decide to cook a second batch you will need to reheat the Oil for several minutes before placing the Wantons in.) 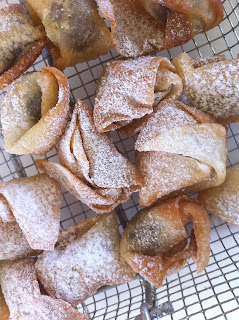 ~ Keep a very close eye on the Wantons as they crisp up quickly ~ Remove when they become a light golden color ~ Place on paper towel to absorb the excess Oil ~ Wait a few minutes and then sprinkle lightly with Confectioners Sugar ~ Sapore! Think of composing this Pie as you would a Lasagna ~ Sauté Shredded Cabbage and Onion in Olive Oil, add a pinch of Salt and then set aside ~ Lightly cover the bottom of a casserole dish with Cilantro Sauce (Recipe Below) ~ Add a layer of Corn Tortillas, then a mixture of Black Beans, Corn, Diced Tomatoes, Sautéd Shredded Cabbage and Onion ~ Cover with Cilantro Sauce again and repeat with a layer of Corn Tortillas, Black Beans ect. 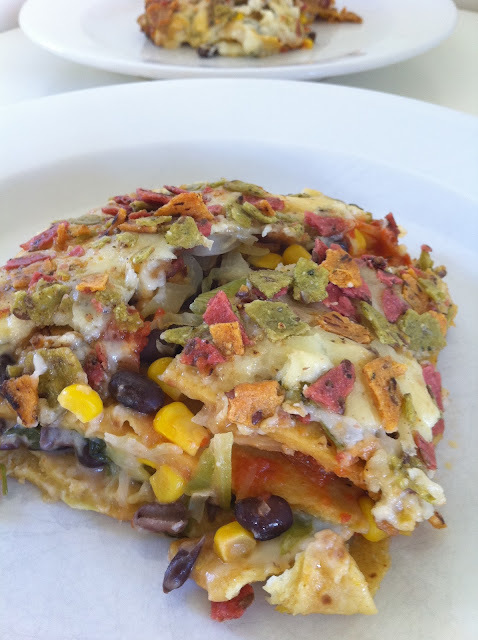 ~ Top with Grated Aged Cheddar and Crushed Corn Chips (Beat Corn Chips in a paper bag to break into little bits) ~ Bake at 350° for 35-40 minutes ~ Serve with Guacamole or my special Creamy Guac Topping (Recipe below) ~ Sapore! In a sauce pan melt 3 tablespoons of Butter ~ Turn heat on low and add 3 tablespoons of All Purpose Flour ~ Mix to a smooth paste and then add 3 tablespoons of Lime Juice and 1 teaspoon of Salt ~ Turn to a medium heat and whisk in 2 cups of Milk and 1 cup of grated Aged Cheddar ~ Once the sauce is close to a boil, turn heat down to a simmer for 10 minutes ~ Add approximately 1 cup of fresh Cilantro (chopped) and simmer for another 5 minutes. Mash 1 Avocado in a bowl ~ Add 3 tbsp of Sour Cream, 1 diced Tomato, several sprigs of Cilantro (chopped), 2 Tbsp of Lime Juice, and a pinch of Salt ~ Mix and serve with Tortilla Pie. In a bowl, crack 1 Egg, add 2 tbsp of Milk, a pinch of Salt and 1 tbsp of Fresh Thyme leaves ~ Whisk with a fork and dip sliced Bread into the Egg mixture (1 Egg should cover 2 pieces of Bread) ~ Grate enough Aged Cheddar to lightly cover the Egg soaked Bread on both sides, then set aside ~ In a large frying pan melt 1 tbsp of Butter ~ Add the Egg and Cheese coated Bread to the pan and cook over medium heat for 4 to 5 minutes a side. 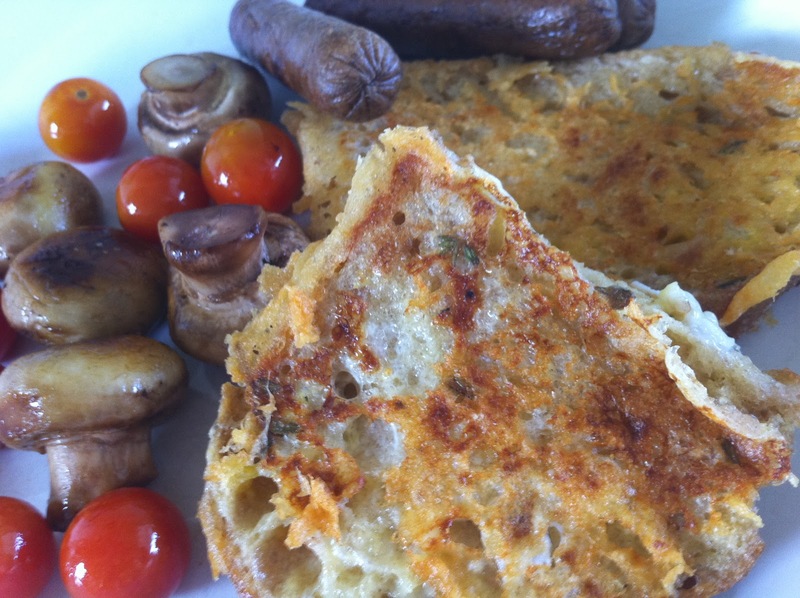 Serve with your favorite breakfast sides such as Tofu sausages and sautéd Tomatoes and Mushrooms ~ Sapore! Squeeze 3/4 cup of Orange Juice or use store bought ~ Add 1 cup of Berries, one Banana, and 3 heaping tbsp. 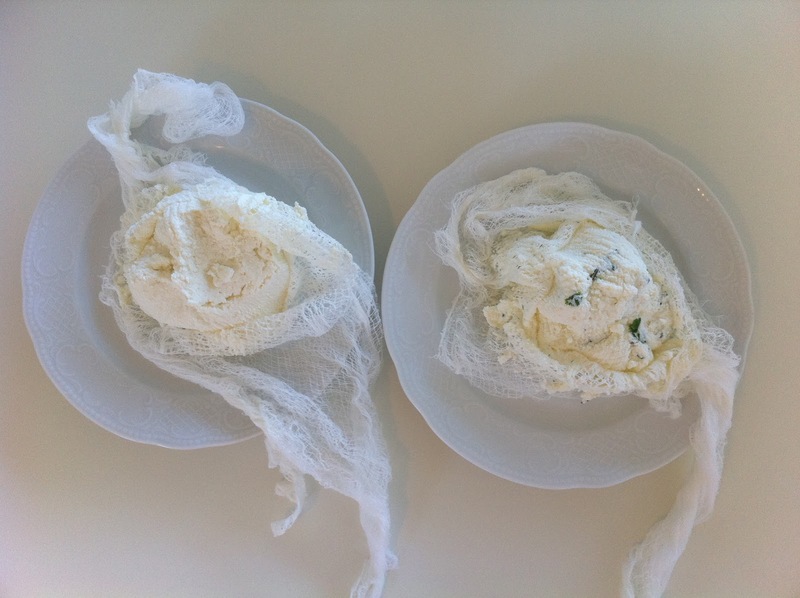 of Plain Yogurt ~ Blend in a blender or use a hand emulsifier ~ Sapore! 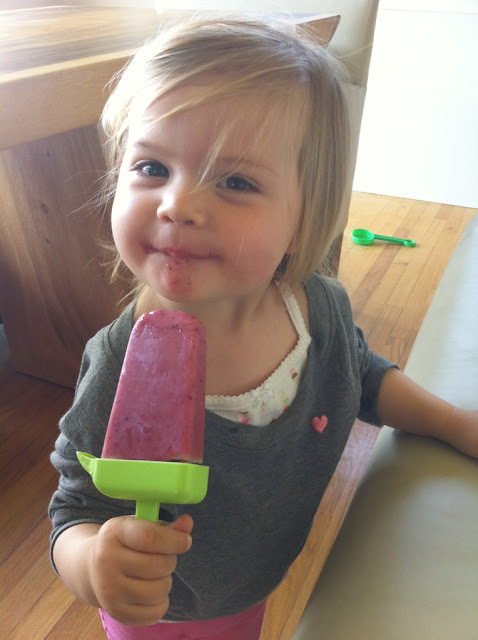 Combine Ingredients and Blend as directed above ~ Fill Popsicle molds and freeze for four hours or more ~ Sapore! Peel and thinly slice 2 Apples ~ sauté Apples in 3 tbsp of Butter until tender ~ add 1 tbsp of Lemon Juice, 1/4 cup of Raisins, 2 tbsp of Sugar and a dash of Cinnamon ~ Turn heat off and let sit until Apple mixture cools to room temperature ~ on a board, place Wonton Wrapper flat ~ add approximately 1 tbsp of Apple mixture ~ gather the 4 corners of the Wonton Wrapper and pinch together making a bundle ~ use one hands length of butchers twine and tie a knot around the pinched area (see picture) ~ deep fry in Canola Oil (I used a deep fryer but a pot of oil works too. Oil must reach around 375°) ~ watch very carefully as Wontons can burn quickly ~ cook until a golden color (approximately 30 seconds) ~ remove from Oil and place Wonton's on paper towel to soak up Oil ~ cut twine with scissors and discard ~ serve on a bed of Caramel Sauce with Vanilla Ice Cream. 2 per person. Sapore! 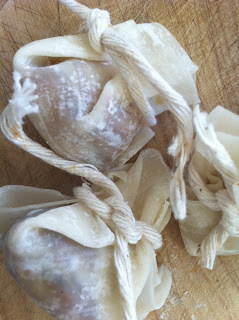 When making bundles don't worry if the Wonton wrapper tear slightly, it should hold together when placed in the hot Oil. Never use two sheets of Wonton Wrappers for one bundle. I've tried this before and it doesn't work because the inner wrapper doesn't have time to cook and just becomes a chewy mess. Also Spring Roll Wraps can be used for larger bundles and in this case I typically would only serve one per person. 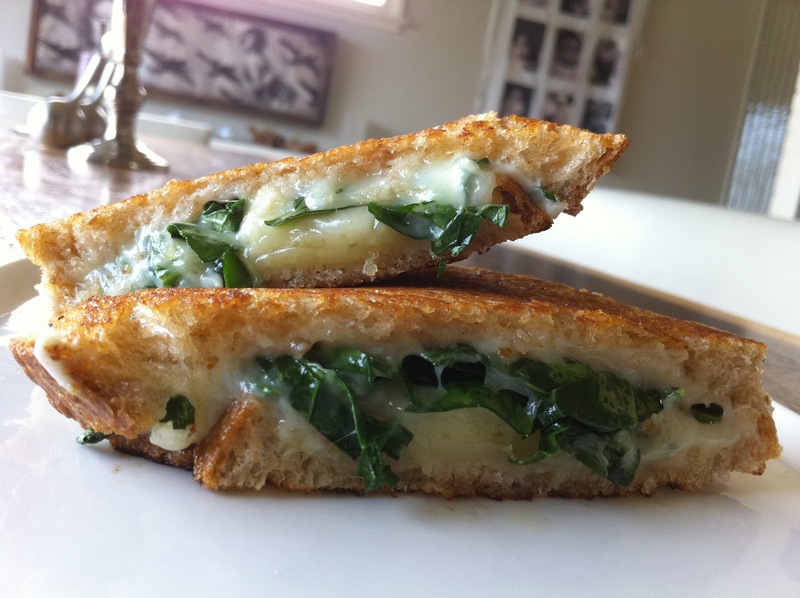 Butter one side of each Slice of Bread ~ On a board, stack a Buttered Slice of Bread (Butter side down), Aged Cheddar, Broccoli Leaves, more Aged Cheddar and the second Buttered Slice of Bread (Butter side up) ~ Transfer Sandwich to a grill or pan and grill Sandwich until the Cheese has melted and the Leaves are slightly wilted ~ Sapore! Discard Skin and seeds from 1 medium to large Butternut Squash ~ Dice Butternut Squash and chop approximately 2 cups of Carrots ~ In a roasting pan add Butternut Squash, Carrots, 1 tbsp. of crushed Ginger, 3 tsp. 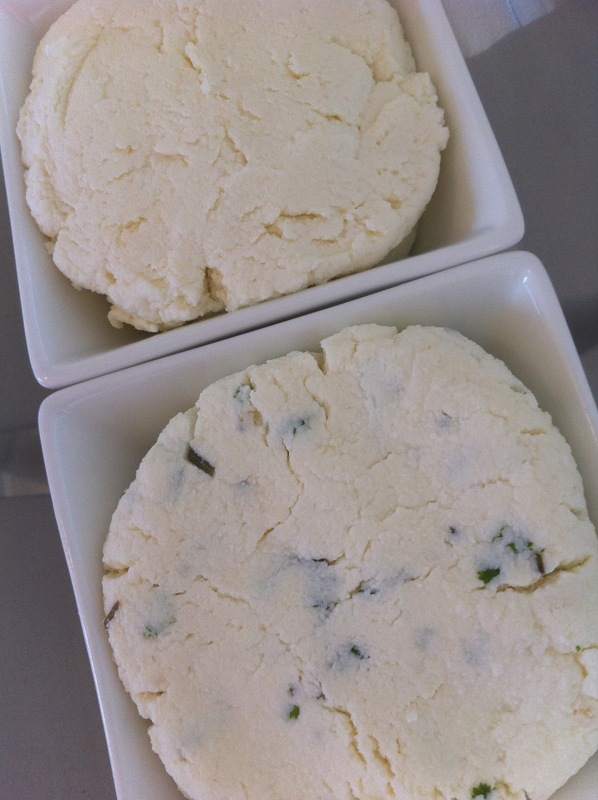 of Butter, 1 tbsp. of Brown Sugar ~ Roast these ingredients for 35 minutes at 400° ~ Add 1/2 cup of Water to the roasting pan and put back in the oven for 15 more minutes ~ Remove from oven and put contents of roasting pan into a big soup pot ~ Add 2 cups of Milk or Cream and use hand emulsifier to blend Soup to a creamy consistency ~ Add Salt to taste (approximately 2 tsp.) 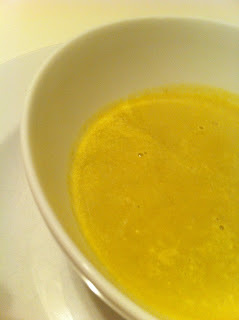 ~ Simmer on low heat for 15 minutes and add more Milk or Cream for desired consistency ~ Sapore! SAsapore is going on holiday! Sorry foodies. SAsapore is going on holiday until February 28th. See you then with more recipes to share. Cook and Salt 1 1/2 cups Lentils to package directions ~ Steam 1/2 cup of finely diced carrots for 5 minutes and then add 1/2 cup of chopped broccoli, and 1/2 cup of frozen peas to the carrots in the steamer ~ Continue to cook for 3 more minutes ~ In a casserole dish, add cooked Lentils, Steamed Carrots, Broccoli, Peas and one large can of diced Tomatoes ~ Mix these ingredients with a pinch of salt ~ At this point, the Lentil / Vegetable mixture should fill about half of your casserole dish ~ Boil chopped Potatoes with the skins on (Potatoes vary in size so imagine that you will need to fill the other half of your casserole dish with mashed Potatoes) ~ Once Potatoes are tender, drain and add 3/4 cup of Milk, 3 tbsp of Butter and then mash ~ Fill the top half of your casserole dish with the mashed Potatoes (top with Aged Cheddar - optional) ~ Cover with lid or tin foil for 40 minutes at 350°, then 15 minutes without cover ~ Sapore! For four years my husband and I have celebrated Valentine's Day on the front lawn of the Trump National Golf Course in Palos Verdes California. The ridge top view of the ocean is breath taking, the sunset is spectacular and the price is right; it's free for anyone to enjoy. We bring a picnic dinner, wine and this year, a sippy cup and toys to entertain our toddler. Make Pesto Mashed Potatoes; Boil Water for Potatoes ~ Chop Potatoes and leave the skins on ~ Boil Potatoes until tender, drain and mash with 2 tbsp's of Butter, Milk (a decent splash to moist), pinch of Salt and Pesto (in a mortar; grind Basil leaves, Walnuts, Parmesan Cheese, crushed Garlic, Olive Oil and a pinch of Salt) ~ Sauté Shiitake and Portabella Mushrooms with Leeks and Cherry Tomatoes in Olive Oil ~ In a pan, heat a sliver of Butter and a splash of Olive Oil ~ Season the dry Scallops with Salt and Pepper and add to the hot Oil ~ Cook Scallops (large) at 3 minutes a side ~ Sapore! 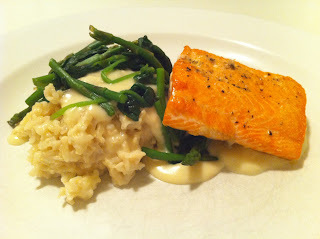 In a small bowl mix 1 cup of Mayonnaise, 1 tbsp of Lemon Juice, 1 Clove of Garlic (crushed), 4 large leaves of Basil and 8 stems of Chive (chopped) and a small pinch of Salt ~ Prepare Salmon by drizzling Olive Oil on top and seasoning with Salt and Pepper ~ Broil Salmon on high for 3 minutes a side ~ Cut Ciabatta Loaf and toast open side under the broiler ~ Spread Aioli on both sides of the Ciabatta and top with cooked Salmon and Pea Shoots ~ Sapore! Ciabatta is an Italian white Bread. In appearance it is long, broad and flat. 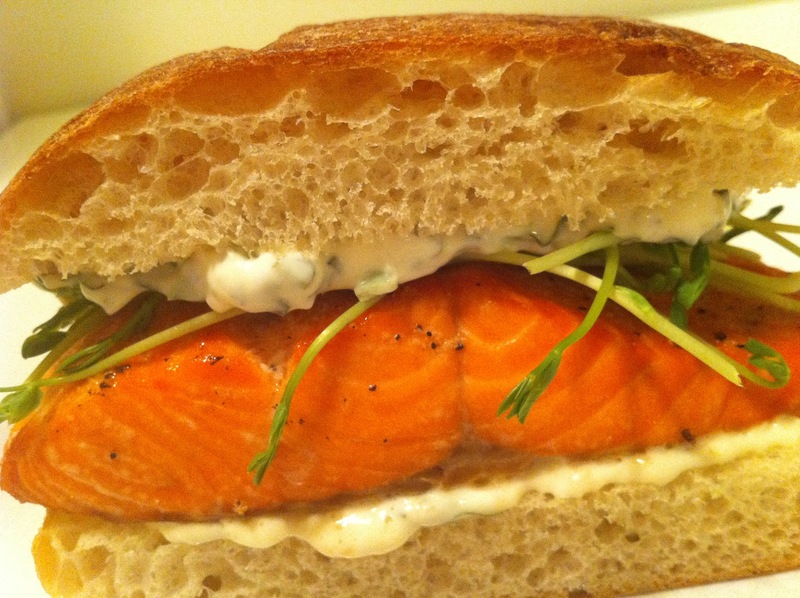 The word Ciabatta means "slipper" in Italian. Ingredients for Salad: Note: Use all or just a few of these ingredients. 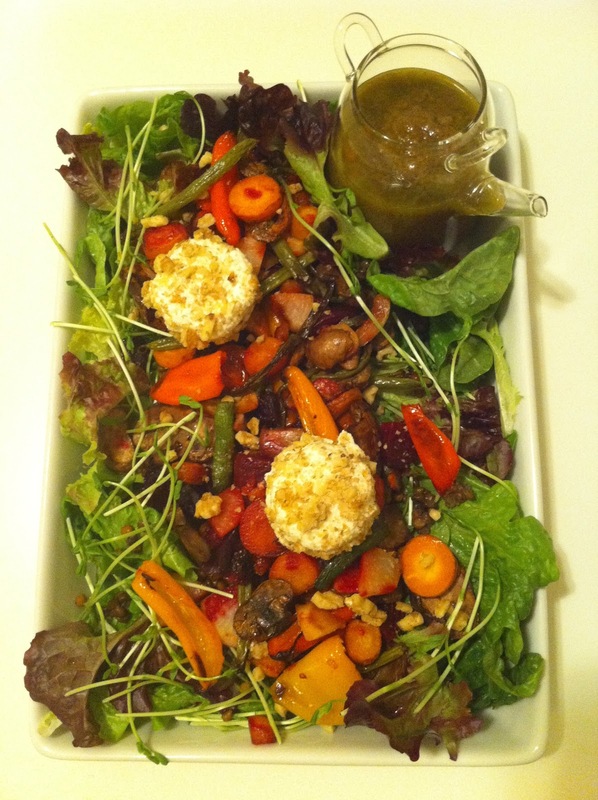 Many Vegetables taste wonderful roasted, so use what ever is in your own refrigerator. Preheat oven to 425° ~ Chop Vegetables (except Lettuce and Pea Sprouts) to desired size, place in a roasting pan, drizzle with Olive Oil and Salt ~ Roast Vegetables for approximately 30 minutes (tossing occasionally) ~ Once Vegetables are tender, remove from oven and let rest until they become room temperature ~ Next, slice a thick round of Goat Cheese and roll in a bowl with Crushed Walnuts to cover the entire surface of the Cheese ~ Wash, dry, tear Lettuce and place in a serving platter or bowl ~ Top Lettuce with Pea Shoots (or Sprouts), Roasted Vegetables, Goat Cheese and a handful of Walnuts or other nuts or seeds. Sapore! Use an emulsifier or a blender to mix 3/4 cup of Olive Oil, 1/4 cup of Balsamic Vinegar, 2 Avocados, 1 tbsp. of Crushed Garlic and 1/4 tsp. of Salt. Sapore! 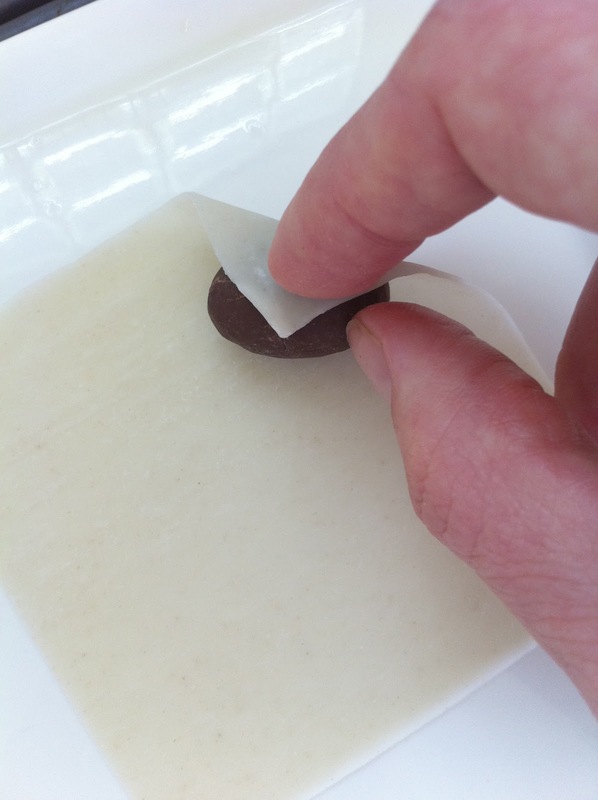 Thaw the Pastry sheet according to package directions (note: the picture above is one Pastry sheet cut in half) ~ Place a bowl and mixing tool in the freezer for Whipping Cream later on ~ Break one Egg and whisk with a fork to make an egg wash ~ With a pastry brush, lightly cover the surface of the Pastry sheet with the Egg wash ~ Bake for 15 minutes or until golden at 375° ~ Remove from oven and let cool on a grated rack ~ In a sauce pan, add 1 cup of fresh or frozen Raspberries and 1/2 cup of Sugar (no liquid is necessary as the Raspberries will produce enough liquid of their own) ~ Slowly bring to a boil and then turn heat to low ~ Simmer for approximately 15 minutes ~ Set aside and wait until Raspberries have reached room temperature ~ Remove chilled bowl and mixing tool from the freezer ~ Add Whipping Cream, 2 tbsp. of Sugar and 1 tbsp. 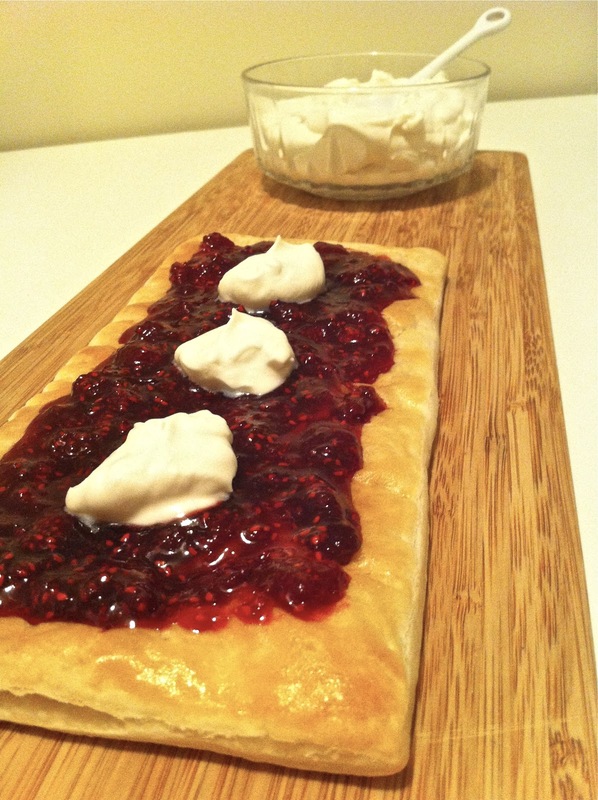 of Pure Vanilla Extract to the bowl and begin to whisk ~ Cream should be a thick consistency but be mindful not to over whisk as it will turn into butter ~ Once the Pastry and Raspberries are at room temperature, spread the Raspberries on top of Pastry and add Whipped Cream. Sapore! Combine chopped Asparagus (use approx. 30 thick stalks or 50 thin stalks), 1 Onion, 5 Carrots and 5 Celery stalks to a large pot ~ Add 6 cups of Water and 1 tsp. 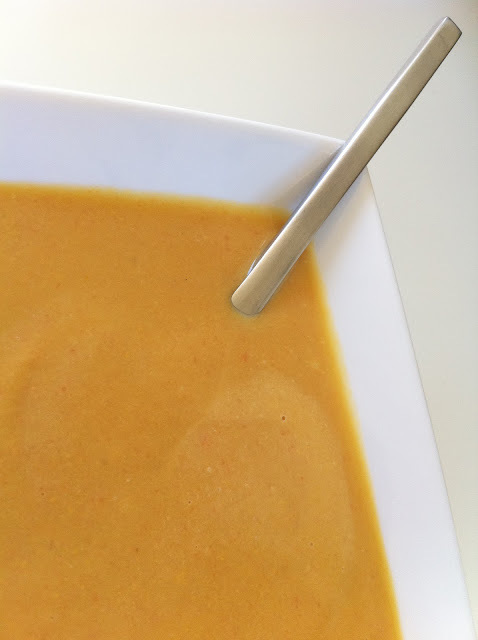 of Salt ~ Turn heat on high and bring Soup to a boil ~ Once boiling, turn heat to simmer for about 45 minutes ~ Add Cream Cheese ~ Simmer for a few more minutes ~ Remove from heat and blend with a hand emulsifier until completely smooth (or blend in a blender) ~ Sapore! Cube Mango ~ Add Mango, Plain Yogurt, Sugar, Milk, Ice into blender and blend. Sapore! 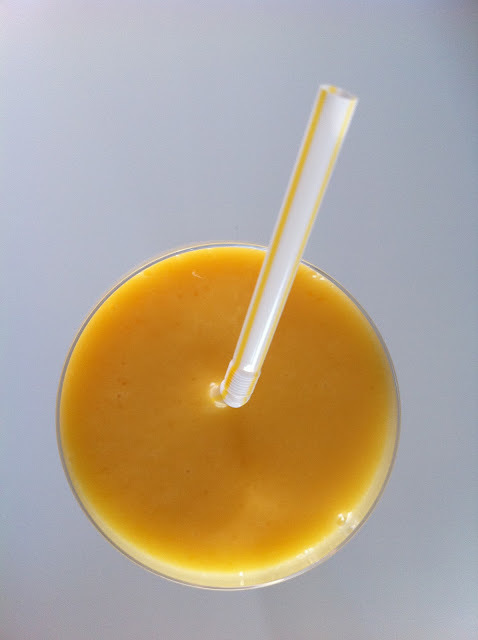 Mangos are a good source of dietary fiber and high in Vitamins A and C. They also contain natural digestive enzymes which can soothe an upset stomach. Clean Fish and pat dry ~ Place on a broiling tray, drizzle with Olive oil and season with Salt and Pepper ~ Broil on high for 3 to 4 minutes a side. Measure 1 cup of Rice with 2 1/2 cups of water ~ Cook in a covered sauce pan over high heat until water comes to a boil and then turn down heat to simmer for 45 minutes. In a sauce pan melt 3 tablespoons of Butter ~ Turn heat on low and add 3 tablespoons of All Purpose Flour ~ Mix to a smooth paste and then add 2 tablespoons of Lemon Juice, 1/2 cup of White Wine, 1 teaspoon of crushed Garlic and 1 teaspoon of Salt ~ Turn to a medium heat and whisk in 2 cups of Milk or Cream (Cream will make a richer, heavier sauce and might require approximately 1/2 cup more to make a good consistancy) ~ Once the sauce is close to a boil, turn down heat to a simmer for 10 to 15 minutes. 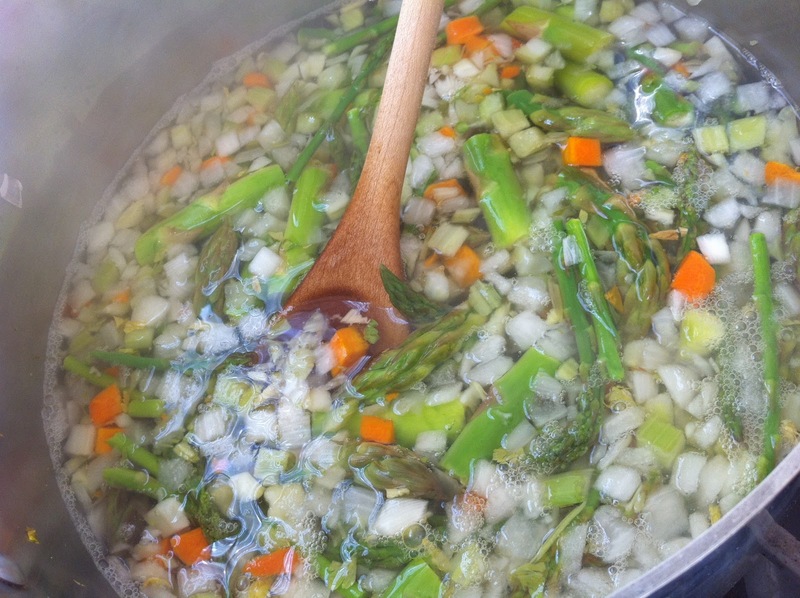 Steam over boiling water for less than 5 minutes, depending on thickness of the Asparagus stalks. 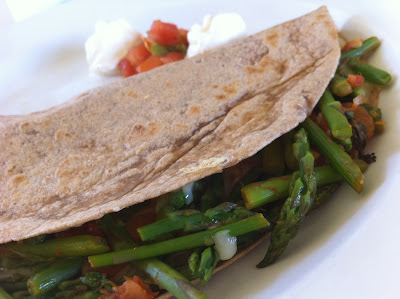 Sauté Asparagus with 2 tablespoons of Salsa ~ Grate Aged Cheddar ~ Place Whole Wheat Tortilla in a large frying pan and turn heat to low setting ~ Cover the surface of Tortilla with Aged Cheddar ~ Once Cheese has melted slightly add Asparagus / Salsa mix to one half side of Tortilla ~ Remain on low heat for a few more minutes then remove and fold in half ~ Serve with Salsa and Sour Cream ~ Sapore! Asparagus is a good source of Iron, Magnesium and Zinc. Also excellent in Folate and Dietary Fiber. 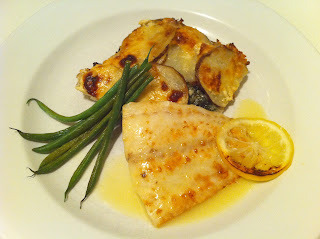 Cover the bottom of a small roasting pan with sliced Lemon ~ Add Wild Cod on top of Lemon bed ~ Pour 1 cup of White Wine over Fish ~ Drizzle with Olive Oil and Salt ~ Bake at 350° for 25-30 minutes ~ When Fish is flaky and tender, remove from oven and drain remaining liquid into a sauce pan ~ Boil liquid on stove top for 2 minutes ~ Remove from heat and whisk in cold Butter (approximately 3 tablespoons) to make a creamy Sauce ~ Salt the sauce to Sapore (taste). In a sauce pan add Milk or Cream (1 to 1 1/2 cups), diced Cream Cheese (1/2 cup), Butter (2 tablespoons) and let simmer for a few minutes until Cream Cheese and Butter have melted ~ Remove from heat, add 1/2 teaspoon of Salt, whisk together and set aside ~ Layer sliced Potatoes and Carrots and washed Spinach in a casserole dish ~ Pour the Milk/Cream Cheese/Butter mixture over the casserole ~ Grate Aged Cheddar Cheese on top of entire casserole ~ Cover with lid or foil and bake for 30 minutes at 350° ~ Uncover and bake for another 15 minutes until a nice golden color. 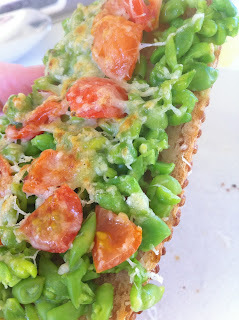 Mash Peas with a small amount of Garlic and add a pinch of Salt ~ Lightly toast the Bread ~ Drizzle Toast with Olive Oil ~ Top Toast with the mashed Peas and Garlic mixture and then the diced Tomato's ~ Grate fresh Parmesan Cheese on top and Broil for a few minutes ~ Sapore (Taste)! 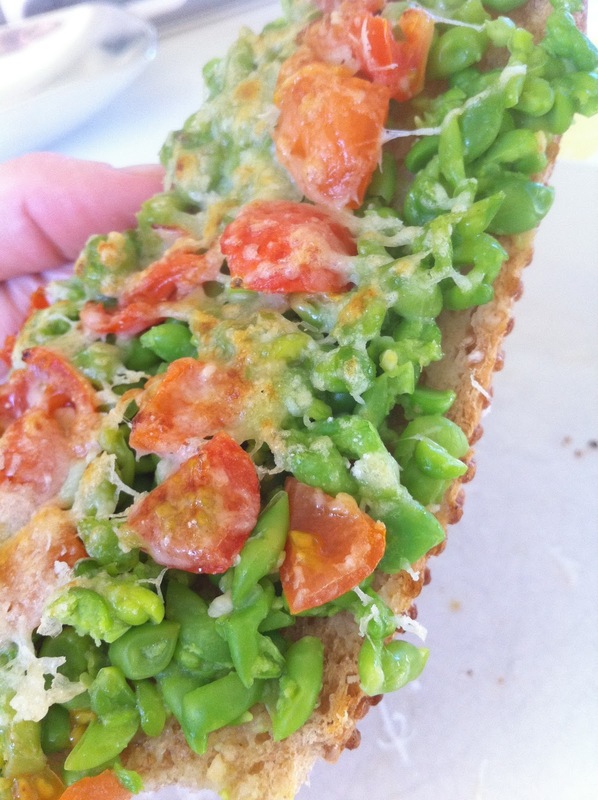 Peas are a good source of protein, vitamin C, K, A and folate. They are also high in fiber. I like my life to be simple: I live at the beach with my family, we have fun, my goals are to live worry-free about tomorrow and to be grateful for today. I have many passions, one of which is good food. 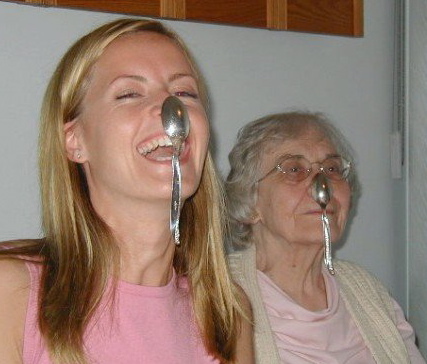 I enjoy complex flavors but equally savor pure ones. 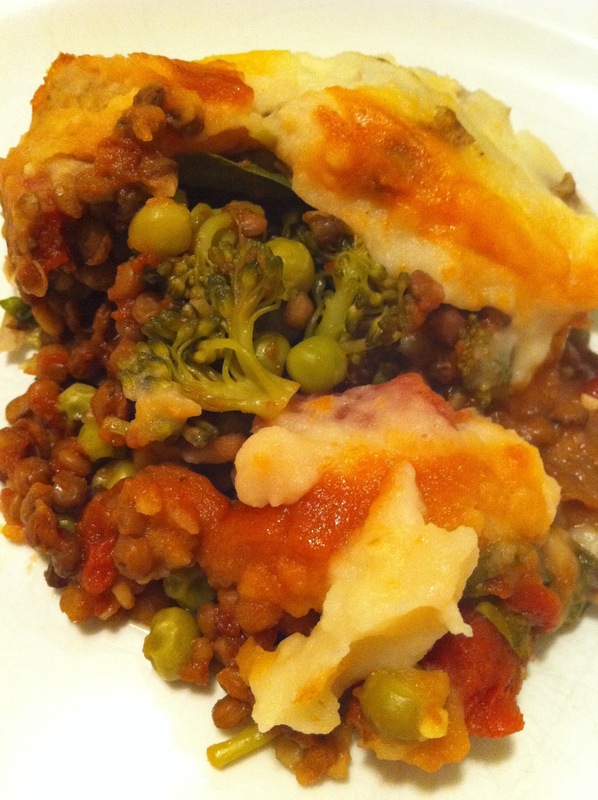 My recipes are designed for everyday, healthy eating. Most are vegetarian with the inclusion of an occasional fish recipe. In my opinion, cooking should be easy. I write my recipes with this in mind. If you like an ingredient then add more of it and if you dislike something, find a substitute or remove it all together. I loosely use measurements such as “a pinch of this” purposely to allow cooks to design their own meals around their personal palates. These recipes please my and my family’s tastes, let them inspire yours! Sapore! 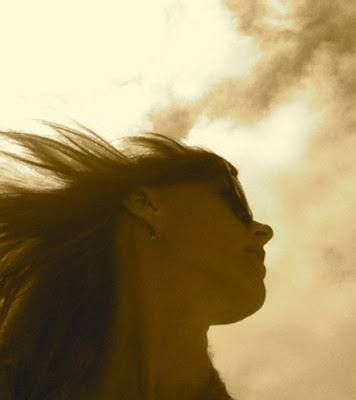 All writings and photographs on this blog are copyrighted © 2011. Simple theme. Powered by Blogger.